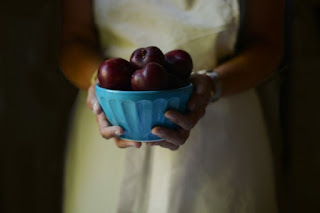 Have you ever tried plums? This fruit has interesting colors and delicious taste. In black plum contains vitamin A, magnesium, iron, potassium, vitamin C, vitamin B, vitamin K, fiber, minerals and also phenols and some other ingredients. Plum fruit is rarely found and consumed by people in Indonesia because it is one of the fruits imported from abroad. However, it doesn't hurt us to know what the hidden benefits are behind this black plum. Black plums contain high levels of vitamin C, which can help improve the immune system to avoid various kinds of infections and inflammation. Black plums contain vitamin K which functions to control or regulate the heart rate and facilitate blood flow. So it's good to prevent blood clots in the body. Black plums contain anthocyanins and phytonutrients which can stop the development of cancer cells but without killing the cells in our body. Black plums contain lots of fiber which is useful to facilitate digestion and improve the digestive system so that it can remove toxins in the body. Black plums contain vitamin A. Vitamin A functions to maintain, protect and improve the quality of the eye organs in seeing. Black plums contain iron which can prevent anemia. Black plums contain potassium which serves to help maintain brain function. It will also improve the thinking process and can help improve concentration and focus. Black plums contain antioxidants that are beneficial to the body and can reduce the number of harmful free radicals in the body. Black plums have anti-hyperglycemic properties which can control blood sugar levels. From the study also proved if black plum can reduce blood glucose and triglyceride levels in the body. Black plums can reduce the risk of type 2 diabetes. Black plums are very good for pregnant women because they also contain calcium and folic acid which can help maintain fetal growth and health. All right, all right, let's not hesitate to try plums!